We're almost out of tissues in our house, so I stashed a pile of cotton muslin squares (aka baby wipes) next to the bed last night which came in very handy. They were nice and soft on my snoz, and it's so easy to throw those little squares in with a load of wash. Then I thought what a good idea it would be to get rid of my tissues altogether (the cost and the waste of trees) and use the reusable baby wipes all the time. Of course I got excited about a new product idea - cotton reusable squares to replace tissues! Think of the savings! And then I realised. I was talking about handkerchiefs. How bizarre that we no longer use hankies. they are cute, useful, reusable, and cut down on waste. 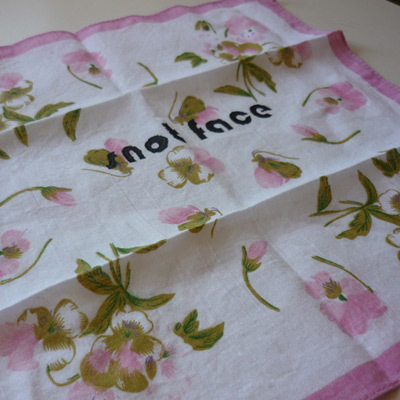 Now it's probably not too hygienic to keep using a wet (yuck) hankie, but that just means you need to carry a few more cute hankies in your bag. Bring back the hankie! PS - cute hankie above customised by Teneale from Wicked Child Designs for the ABCD Meetup goodie bag in Brisbane November 2009.